Sourced from some of the finest Central Coast wine regions, our single vineyard wines express both the beauty and uniqueness of their localities. Just as an artist chooses their canvas, we have selected each vineyard for its individual characteristics that enhance each of our grape varietals. The Livermore Valley is the perfect climate for growing world-class wine grapes. Forty-degree temperature swings daily during the growing season allow for longer hang time as the grapes mature during the warmer, sunny days, yet slow down and maintain their acidity during the cool, breezy nights. This not only creates lower yield, higher concentrated berries, but allows for full development of sugar, adding complexity to the grapes, as well as producing bright, bold fruit flavors in the wine. From our Livermore Valley vineyards, our portfolio of wines includes traditional Bordeaux inspired red blends of Merlot, Cabernet Franc, Malbec and Cabernet Sauvignon from the Crown Block Vineyard; Award winning Chardonnays and a field-blend of Zinfandel and Petite Sirah from the Hoffman/DeMayo Vineyard; Merlot from the Picazo Vineyard; and Cabernet Sauvignon, Petite Sirah and Syrah from the Madden Ranch vineyard. From Rava’s Blackjack Vineyard in Monterey we source our rare and exceptional Grüner Veltliner as well as an expressive Sauvignon Blanc and Pinot Noir. Each wine features an image of its terroir painted by Darcie, which serves to communicate the characteristics of each vineyard. 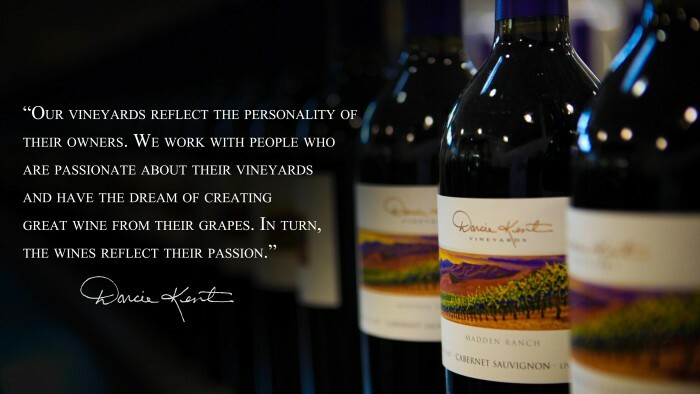 The finest wines begin in the vineyard, and that’s why we choose to work solely with grapes from the most respected family growers in the Livermore Valley and beyond.